MANILA, Philippines – Another “challenge” is taking the Filipino netizens by storm and is now making its way mainstream. The #PakGanernChallenge is not just your average hyped dares on social media, it brings you back to your childhood memories. Definitely #PakGanernChallenge has taken the interest of Filipino millennials. The hand maneuver game is said to resemble how “Nanay-Tatay-gusto-ko-tinapay” works—a Filipino game everyone did back in their childhood. One can even claim it as the new millennial version of the former. #PakGanernChallenge was started by an entertainment group Pilyoz Dancing Statueswhom according to them, created the game as an entertainment to diverge from all the negativity happening around. A second version of the challenge is created by friends Ericka Lumbro and Leorie James Balito, which popularized it even more. The game resembles how “Nanay-Tatay-gusto-ko-tinapay” works. But one must have a quick mind under pressure and some hip shaking moves. The challenge is really fun and interesting that it made its way to afternoon TV as Vice Ganda and other “It’s Showtime” hosts picks it up and play the game. 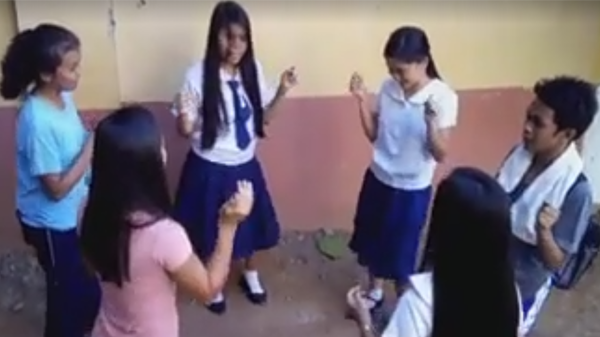 Ang laro ng tunay na lalaki "PAK GANERN"
That started boosts the made-up game’s social media popularity—now everyone else’s hip is swaying doing the #PakGanernChallenge. Or even go for a just-you-and-me mode! #PakGanernChallenge really made an impact to our childhood selves that people are bringing it back to the streets and getting caught by the CCTV doing the deed! Before #PakGanernChallenge is another different challenge as netizens sing songs, and lines in movies replacing it with the phrases ‘Pak’ and ‘Ganern’. It was also subjected into various memes. Check out this 'Be Careful Who You Bully Challenge': Celebrity edition! WATCH: Are You Up for the #FlipBottleChallenge? Invite your friends to relieve your childhood selves in #PakGanernChallenge and tag us in your videos!